Last week we discussed the basics of allowing credit/debit card payments, and how our system can handle any type of card payment transaction your institution needs. Is the card valid and not reported as fraudulent or stolen? Is the card active with enough credit to make the payment? This is an extremely helpful service provided by card processors and our system, and one of the main reasons many institutions like to allow card payments. It makes getting payments a little more reliable than waiting for a check or ACH transaction to clear. However, card payments are not without their set of issues. For example, if your institution allows recurring payments via a card, you need to be careful of the card expiring or reaching its maximum limit. This topic explains a few best practices to follow for card payments. What is a Recurring Card Payment? A recurring card payment is when a customer or user sets up a regular or specific payment amount to be paid via a card every payment frequency. For example, a customer sets up a recurring payment of $100 on your payment website to be applied to their card every month two days before the payment Due Date. Usually when a customer sets up a recurring card payment, they enter all their card information one time. 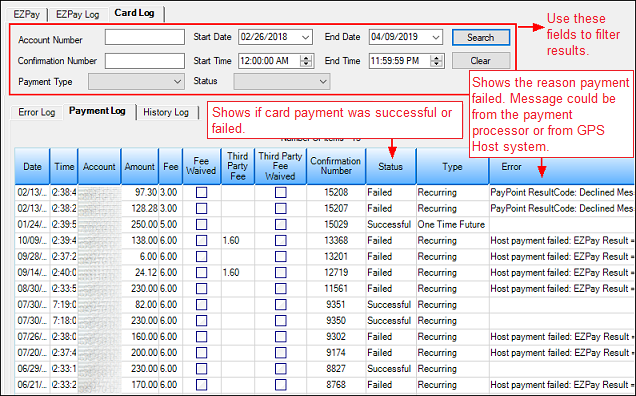 Then month after month (or each frequency), the system pulls the amount of the payment from the card on file. The challenge comes when either the card on file is past the expiration date, the maximum credit limit is reached (in the event of a credit card), or there are not enough funds in the account attached to the debit card. If one of these occurs, in the morning when the system pulls the recurring payments, the payment is rejected by the card processor and a record of the rejection is sent to the Card Payment log. This is just one example of why card payments might be rejected. The loan has reached maturity and your institution does not have the option to allow payments past the maturity date. The payment would be enough to pay off the loan, and your institution does not have the option to allow recurring payments to pay off the loan. 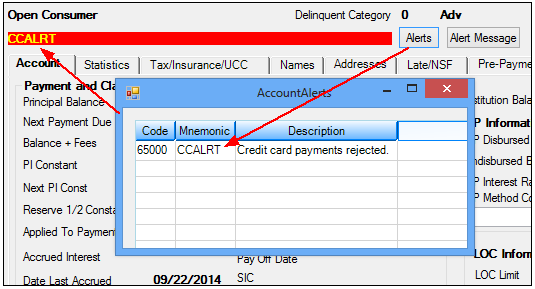 The General Ledger accounts used for fees is either not set up or has become inactive. A Hold Code has been set up on the account that causes transactions to be rejected until the Hold Code is cleared. Internet and Phone Systems > User Activity Log screen, then click <Card Log>. Loans > Transactions > EZPay screen, then Card Log tab. Note: This tab only shows on the EZPay screen if the EZPay option, Show Card Log, is set up for your institution. This option can be set by your GOLDPoint Systems account manager. You can filter what is shown on this tab by specific account numbers or a range of dates, as well as filter by Payment Type (recurring or one-time future) or Status (payments that were successful or payments that failed). To view all payments that failed, we suggest leaving all fields blank except the Start Date and End Date fields and selecting “Failed” from the Status field. In the Date fields, if you are reading the logs every day, you can enter yesterday’s date in the Start Date and today’s date in the End Date, then click <Search>. The system will show you all card payments that rejected during last night’s card payment processing, as well as a reason for those rejections. Once you see which accounts had rejected card payments, you can manually handle the account accordingly, such as assigning users to contact those borrowers about making another payment and setting up new, valid cards for recurring payments. CAUTION: Each afterhours, the system will continue to attempt making the recurring payment to the card, and the payment will continue to end up in the Card Log as a rejected payment, unless the recurring card payment is discontinued or other efforts mentioned above are made. Additional help: GOLDPoint Systems can automatically send your institution a file generated from the card processors every morning showing each of the accounts that were rejected. 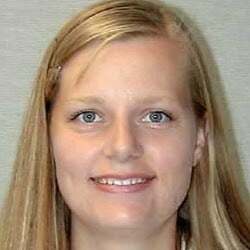 Your GOLDPoint Systems account manager can help you set up that email address to receive those files. Institution Option CCAC must be set up to allow these alerts. Users can then set up an ACH payment for customers if their recurring card payment is rejected or set up a different or newer card. You can set up the ACH payment using the Loans > Transactions > EZPay screen, then select the E-Check radio button instead of the Debit/Credit Card button. 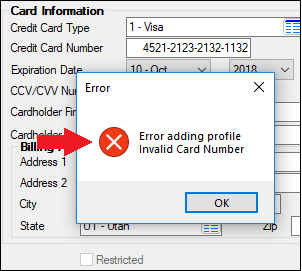 You may also want to click the Card Profiles link on that screen and restrict the rejected card from being used in the future. You will need to manually remove the alert once a new recurring card is set up on the account, or once the recurring payment is removed from the account and the account owner elects instead to use ACH payments or another type of payment other than card. 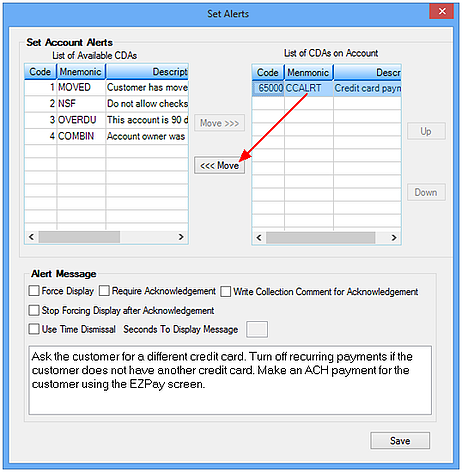 To remove the alert from the account, click <Set Alerts> on the Actions, Holds and Event Letters screen, then select the card alert in the List of CDAs on Account, and then click <<<Move button. See below.